Alexis knew that her birth would probably go fast with her fourth baby, her 3rd boy, since her previous labors grew significantly shorter each time. Even still, she tried to not get her hopes up for a super-fast labor, just in case this one was different. Alexis and her husband have 7 children between the two of them, making this their 8th, but this was Justin’s first son! Towards the end of the pregnancy, they decided to hire a birth photographer because this being Justin’s first boy, he’s wanted so badly to have every moment documented to remember. Alexis arrived at the birth center with consistent and uncomfortable contractions. After being checked and found that she was dilated to 5 cm at 12:30am, she decided the birth pool would be a nice chance to relax and get into the groove of her labor pattern. Contractions only picked up from there. Within 45 minutes, Alexis had moved to her knees where soon after, her water broke on its own and she felt her son’s head coming! The midwife was prepared and quickly came over to catch baby Leo. Alexis took two more pushes to bring her baby’s shoulders and body out into the world where he was lifted up out of the water by Amy and his Dad, Justin. Shortly after Mom and Baby were out of the tub and back in bed, the other children got to come in and see their new baby brother and take their turns holding him. This baby isn’t just their 8th child, but it’s their first baby together. 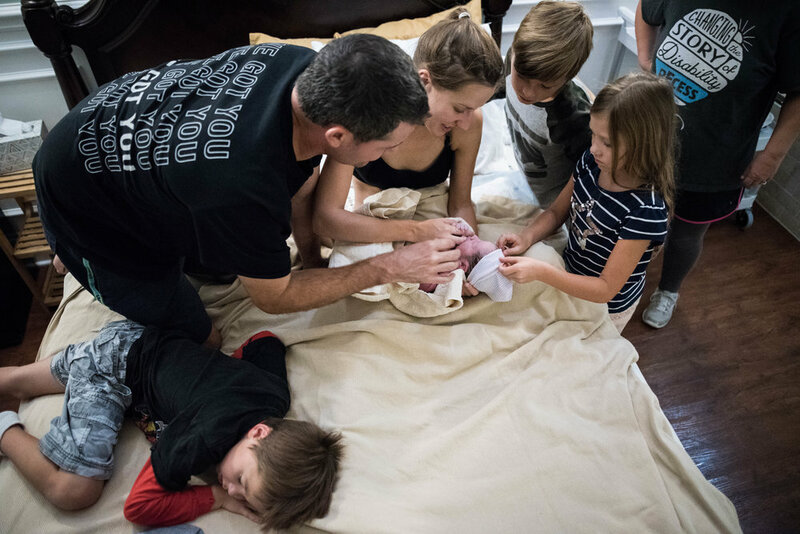 It was so important to them to have a professional birth photographer present. And birth photography isn’t just another luxury. It serves a deeper purpose—to empower women in their bodies and souls, to document the coming to life of a new season, and for this family, to act as a “healing balm,” as she put it, to their past wounds. I’m so honored I was able to capture these incredible moments for this beautiful family.